I’ve been catching up on readings for friends over the past few days. Here is one for my friend, Randy. He is having a hard time and wondering when it will all end. It’s a good sign that you got the Star as your first card. It says right there that you shouldn’t give up hope. I take the Queen of Cups to be Bely. She’s sensitive, sensual, nurturing and emotional. The queen of cups is offering you the cup– like a cool drink of water; she is there to be your refreshment. She’s always going to be there to help you through whatever you need. A lot of messages in the reading tie back to the Strength card but let’s just take a look at Strength at face value initially. You’ve got the strength to persevere– just take control and be confident. An end to the hardships are coming your way if you listen to the messages in this reading and take note. Three of wands reversed — There have been set backs but these set backs are important to you developing your strength. You need to build a plan and take baby steps in your career, finances and relationship problems. Use the strength you’ve developed to pull through. The Hanged Man reversed also points to delays but combined with Death, it indicates that you can’t play the victim. You need to become proactive and start making changes now. Echoes of Strength resonate here as well. 8 of Swords Reversed — The release from your problems and troubles will come after you work out your internal issues that started with the knee injury. You need to become more open, self accepting and confident again. The knee injury was a lesson sent to help you develop emotional and mental strength. Also, make sure to continue to take good care of your injury and your body. Your physical strength has been a great source of your power for a long time, so continue to use it to balance your head and your heart. 5 of pentacles reversed– This is a good sign! Your financial troubles will be subsiding soon. There will be a new source of income (I take this as Bely getting another job). Your depression and bad luck will also come to an end once you recognize your strength. Also, your spiritual well being needs to be addressed. Queen of Pentacles reversed — Even though it’s a queen, I took this card to represent you when I started thinking about it because of the hair. Also, the Queen of Pentacles is nurturing and you love to take care of your pets. This card indicates that you need to get out and socialize a little more to take your mind off your troubles. Self-care is really important right now but you’re focusing so much on nurturing your pets and other people that you’re missing out on taking care of yourself. You need to accept help around the house, especially from Bely. Let her know what she can do to help you because she is there offering the cup of relief to you. All in all, I think that once you start seeing the hardships as things you experienced that helped you develop strength; you’ll be able to get back on track. The answers are there, you just need to build your spiritual mental, physical and emotional strength back up. Just see this period as a period for all encompassing strength and endurance training. 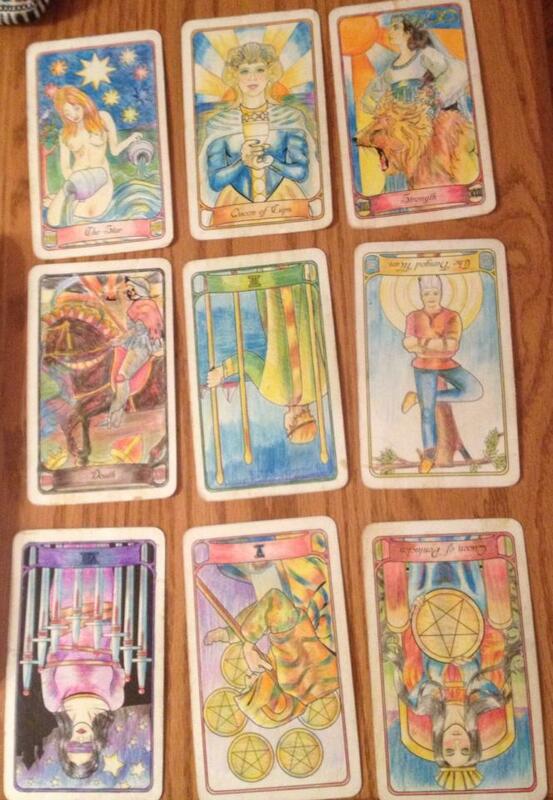 This entry was posted in Uncategorized and tagged divination, self help, tarot, tarot reading. Bookmark the permalink.